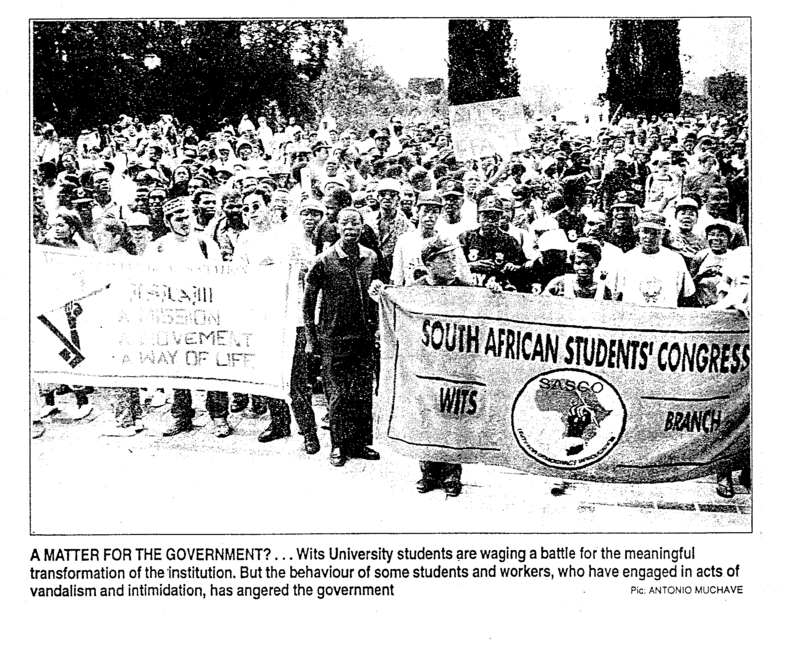 Anarchists/ syndicalists had some presence at the University of the Witwatersrand (“Wits”) in Johannesburg since the early 1990s through ARM, then WSF, the BMC, and then through the ZACF, including for example, involvement in student protests in 2007. They also had a sporadic presence in the Wits Workers Solidarity Committee, which worked with outsourced cleaners, and were part of the “Anti-Government-in-Exile of Wits University” — the latter was a broad group that, in late 2011, deliberately disrupted campus cleaning through direct action and its members were charged with disciplinary infringements by the University management. From 2010, there were study groups and the creation of a ZACF-linked student Inkuleleko anarchist group. Anarkismo preface (not part of the statement) in italics: Beginning on Sunday 28 August, Wits students have been littering parts of campus in solidarity with the cleaners’ strike. Cleaners throughout South Africa are demanding a living wage of R4 200 per month: this compares with less than R2 000 paid to cleaners at Wits, who are employed by outsourcing companies such as Supercare. The strike has been undermined, at Wits and elsewhere, by the presence of scab labour; Wits management and the outsourcing companies are striving for “business as usual”. This undermines the entire purpose of the strike, which is to compel exploiter-managers to meet workers’ demands by withdrawing their labour, by preventing the job from getting done – by making sure the campus is not clean. Striking workers are unable to keep up a picket line or do anything about the scabs because they have been barred from campus. A court interdict has ordered them not to come within 20 metres of any workplace; and their Wits access cards have been blocked for the duration of the strike. This leav€es it to Wits students and staff to act in solidarity with the workers. The purpose of Operation Litter is to undermine the scabs and help the strike to achieve its purpose. On Tuesday 30 August, three students were summoned before Deputy Vice-Chancellor Yunus Ballim on less than two hours’ notice. Ballim was acting under rule 1 of Wits’s Rules for Student Discipline, which allows top management to suspend students if they think we are “guilty of misconduct”. Ballim told us that this rule is designed for emergencies; that he considers us a “threat to the university”; and that what he is doing is what he does when a student appears to be engaged in assault or sexual abuse. This view of Ballim is, quite simply, an insult to anyone who faces assault or sexual abuse. How can there be any comparison between such crimes and our actions? We have acted in solidarity with strikers to strengthen their resistance. We have harmed nobody, nor in any way threatened the activities of higher learning. Which “university” does Ballim think we threaten? If he regards this nebulous “threat to the university” as somehow similar to sexual abuse, we must worry about his commitment to opposing sexual abuse. They cut academic staff as part of restructuring measures, and persistently maintain insufficient numbers of teachers for lecturing, tutorials and supervision. They phase out bridging programmes to help students make the transition from school to university. They encourage academics to orient their research to profitable activities, i.e. to the needs of capital and the rich ruling class. They continually increase fees, closing the doors of learning and culture to poor students, and slam the doors in students’ faces with massive up-front payments that prevent us from even entering the halls in the first place. They impose bureaucratic hurdles to hamper the ability of students and staff to publicise radical views on campus, while readily opening their doors to representatives of the murderous racist state of Israel. By outsourcing cleaners and other workers since 2000, they undermine union organisation and leave these workers far less able to defend themselves. They not only cut in half the wages of the outsourced workers, but deprive their children of the opportunity for free education at Wits. They condone apartheid practices by restricting outsourced (overwhelmingly black) workers to separate entrances, separate eating places and separate toilets, and ban these workers even from holding meetings on campus. In short, they strive to turn higher learning and public discussion into a commodity available to a few, and undermine the universal culture of vigorous debate and progress that has long been part of higher learning at Wits. Who, then, is a threat to the university, and who are its defenders? We are now exiled from the political life of Wits, but we will be back. We have done nothing wrong, we have harmed no one, we knew the risks, we have no regrets. We remain committed to the struggle of students and workers, and we stand behind our fellow Witsies as they continue their solidarity actions. We remain behind the workers as they carry on the strike, behind the fight to put an end to outsourcing and bring the workers back to Wits – and behind the great battle to take back our university, to make a place of higher learning that belongs not to a few managers and capitalists, but to all who live and work in it. 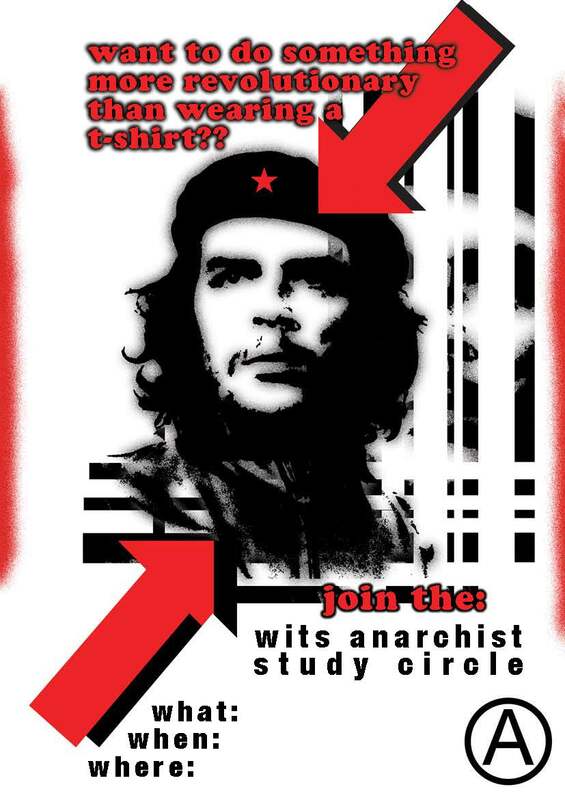 Anarchist / syndicalist study groups have a long (if erratic) history at Wits. The following poster was one used in 2011 to attract people to the study groups run by the ZACF-linked Inkuleleko Anarchist Collective.